Just two hours from Helsinki lies a choice of two handcrafted, traditionally-styled cabins, Taina and Vesa. Both offer a comfortable and welcoming log cabin base for a host of winter activities in the surrounding area. 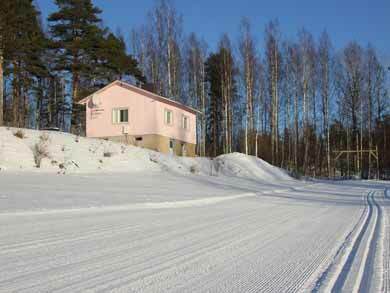 Cross country skiing is possible right from the door. Photo: UT. Cabin Taina and Cabin Vesa are located approx. 800m apart and each sleep up to 8 persons in 3 x 2-person rooms with additional beds available for another 2 persons, making the cabins suitable for couples, families, or groups of friends/two families travelling together. Both cabins have wood-heated saunas, an essential part of Finnish culture and a wonderful way to round off the day, and offer privacy and tranquility in a beautiful forest setting. In wintertime (normally mid-December to March), a cross country ski track starts right from the door and runs through the pine forest. Ski equipment is available to hire and introductory lesson can also be arranged. The cabins are an ideal base for winter adventures for adults or families. Photo: TET. 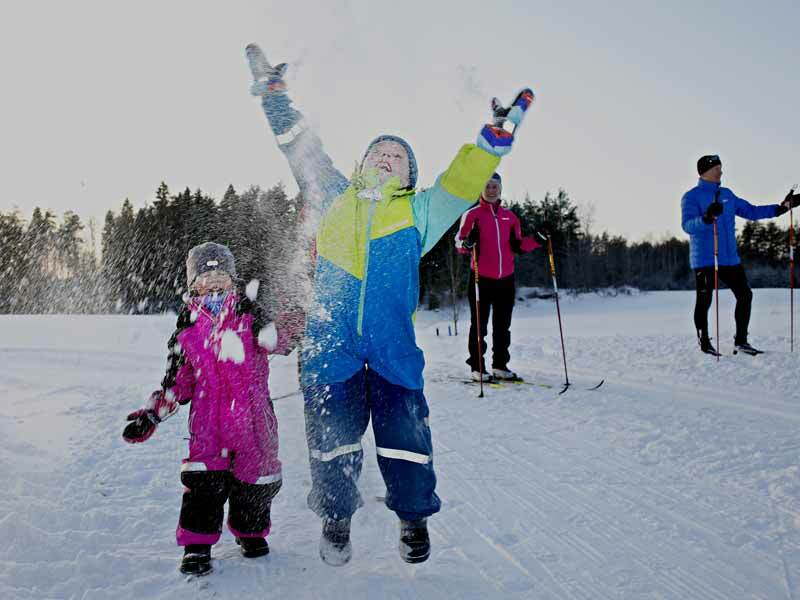 Snowshoes, kicksled, ice fishing equipment and ice skates can also be hired as alternative ways to enjoy the winter landscape. Ice skating on natural ice on the nearby frozen lake is a great introduction to this wonderful winter pasttime. Skating tracks are prepared in wintertime, allowing you to discover the freedom and adventure of outdoor skating in an accessible way. The cabins are available for booking year round. Season for winter activities typically mid-December to March, summer activities season May to September. Sleeps up to 6 persons comfortably with 3 x 2-person bedrooms (Cabin Vesa has 3 x 2-person rooms which can be twin or double, Cabin Taina has 1 room with double bed + 2 x twin/double rooms). Able to accommodate up to 8 persons with an additional sofa bed (most suitable for children) in the hallway and a crib is also available. Washing room, dressing room and 2 WCs. Total area of 120 square metres. Siuated on slope overlooking pine forest and own natural frozen pond with jetty. Around 800 metres from the frozen lake. 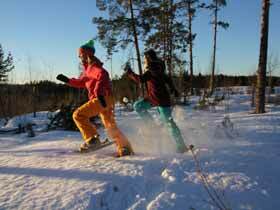 Located on small pinewood hill and about 50 metres from the frozen lake. 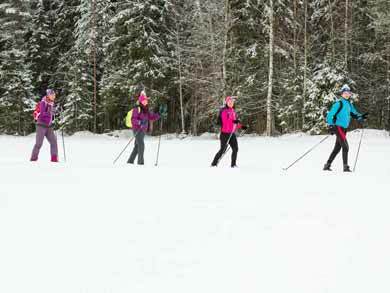 Cross country skiing trails from 6 to 11 km are available from your doorstep. Food: The cabins are fully-equipped for self-catering. The nearest shop is 7km away, 10 mins by car. NB: Please note if you choose not to have a car during your stay that you must have ALL provisions with you before leaving Sysmä. There are no facilities where the cabins are located. See "Optional extras" below for information on transfers if travelling by public transport. The cottage can accommodate up to 8 persons in 3 x 2-person rooms and additional bed in hallway. Located on an organic farm and your local hosts use organic products on their fields and production is checked every year to meet the standards for organic farming. The cabins are built using wood taken from the surrounding forest and logs hand-crafted using an axe. Log Cabin Getaway in Päijänne Tavastia is the summer version of this experience.